Taverns and inns served many purposes other than as bars and hotels. A farmer did not have to be able to read. He could recognize a Red Lion, George Washington, William Penn, a Spread Eagle, the Turk’s Head…painted on the sign outside. They were like street signs and information booths for visitors seeking directions to relatives or locations of houses, farms, blacksmiths, lumber yards. Most patrons were male. Taverns were the living rooms for most neighbors because houses were small, ill-heated, crowded with children, and bereft of extra food and drink. A host would naturally entertain his cronies at the local tavern. Courtesies were exchanged in the form of drinks, and deals sealed by beverage. The taverns also served as spaces for serious business: voting place, post office, general store. The Black Horse Inn, built c. 1720, stood at the entrance to Lower Merion at City Avenue and Old Lancaster Road. The Drovers. There were many kinds of taverns. Drovers of cattle had favorites, which had pasture land behind, or nearby, to accommodate huge numbers of animals with water and fodder available…enough to keep up the weight of every animal destined for stockyards in Philadelphia. These were the “long roaders” and the Red Lion in Athensville (Ardmore) was especially favored with its original 30 acres. When the animals were gathered in for the night, wagonloads of hay moved through the herd with a man pitching fodder right and left; water troughs were kept full. Fortunately, properties surrounding such lots were spacious, houses scattered, and the owners not too fussy about smells. If you made the trip to town behind either a drove of cattle or a 100-mule packtrain, yours was not a journey in a rose garden. King of Prussia Inn sign. The “Ordinary.” Well before the Revolution, the “Ordinary” supplied a menu at a fixed price, as well as a warming drink. Some catered to a better class of customer than the “long roaders.” In many cases, a blacksmith and wheelwright opened shop close by. The Conestoga wagons would pull into a tavern (or “stand”) for the night. Drivers would have dinner and companionship for awhile, but in good weather, to avoid room rent, retire to sleep in their wagons. Joseph Price, diarist, in his short tavern-keeping career, deplored this custom. Further west, beyond Lower Merion Township, is the famous King of Prussia Inn and its distinctive sign, reputed to have been painted by Gilbert Stuart. British spies were known to congregate there seeking information about the troops at Valley Forge. Swallowed up between bustling highways, the inn’s demolition was halted by action of an historical society in 1953, and moved to a nearby location. The King of Prussia Inn. 65 Choices. There were “tap” houses run by Irishmen beginning in the 19th century. These catered to farmhands, immigrants, and roustabouts. A slug of “red-eye” with a seegar (cigar) thrown in, cost three cents, wrote Josiah Pearce of Ardmore. Between Philadelphia and Lancaster, 61 miles, there were 65 taverns. “The traveller never was faced with a horrible death by thirst” (Josiah again). Houses of refreshment along the Schuylkill’s canal catered especially to the muleteers responsible for driving mules to pull canal boats. Brawls, murders, and intense domino games characterized some of the river taverns. Wagoneers also participated. They traveled in from farms, used Ridge Pike, then came down to cross the Schuylkill and go into Philadelphia via River Road. Some confusion as to names of these taverns results from the innkeepers moving from place to place, carrying the tavern signs with them: Robin Hood and Samson and Delilah, for instance. The First Owners. Myths overlaid facts about this special gathering place for more than 250 years. Somewhere in or under the building stand remnants of original walls built in 1709 for Robert Jones (Robert ap John), second of four sons of John ap Thomas, Quaker leader and co-purchaser of land directly from William Penn, who died before the family sailed to America. Robert was a member of the Provincial Assembly and a justice of the peace in colonial times, but never an innkeeper. When he died in 1746, he left the property to grandson Silas Jones of Darby who rented it to Anthony Tunis. Tunis, so far as is known, was the first to operate an “Ordinary,” serving meals at a fixed price. By this time the country road passing the Tunis Ordinary and the Quaker meetinghouse next door had become an important route west, the King’s Highway or the Great Conestoga Road. welcomed by a line of regulars. The inn sign on the roadside shed. Came the Revolution. The road, which in less than 100 years had lengthened the link between Philadelphia, Lancaster and towns beyond the Susquehanna River, provided a way for both British and patriots to march. It carried coaches filled with Continental Congressmen fleeing to York, and regularly accommodated long packtrains carrying provisions to feed the city. In 1775, Abraham Streaper (also Streeper) bought the inn, probably enlarged it, and continued the establishment as a place of rest and refreshment. Streaper’s wife, Hannah, was a great, great granddaughter of Dr. Thomas Wynne, William Penn’s compatriot. Perhaps Washington had a bowl of soup at the Streepers, but proof is lacking. The next day, from the Buck Tavern about three miles west along the Lancaster Road, the General sent a plea to Congress for blankets and provisions “the season becoming cold…” Washington took his army west to prevent the British from reaching an American supply depot at Reading; meanwhile Cornwallis took Philadelphia on September 26. Three months would go by before weary Americans settled into winter camp at Valley Forge. The General Wayne, c. 1900. Now operated by James Baird, the workers line up out front for a photo. Naming the Inn. When did the tavern get its name? Probably after Mad Anthony’s triumph at Stony Point, New York in 1779. In 1790, an appeal was advertised for a stolen horse to be returned to “Abraham Streeper, living at the sign of General Wayne.” Although much repeated, the story is not true that on February 6 or 9, 1795, three troops of Philadelphia Light Horse came out to Streeper’s to celebrate General Anthony Wayne’s return from victory in the Battle of Fallen Timbers. A neighbor, Joseph Price who frequented Streeper’s bar and was “sparking” Mary Streeper, kept a diary. For the days mentioned as the time of welcome for General Wayne, Joseph records nothing more exciting than a bit of fox hunting, coffin making, and attending Merion Meeting next door. An unusual side view shows the narrow dirt Montgomery Avenue. On February 10, Joseph set off in the snow for Norristown, on behalf of Mary to obtain a court order to sell Streeper’s Tavern to pay debts. It was hardly a time of wild celebration at the tavern; no feasting on “assorted pastries and baked goods brought in by the farm wives from far around the Merion area” as one romantic wrote. Edward Price bought the inn and the next day deeded it back to Mary Streeper, now cleared of debt. Alas, she married Titus Yerkes, not J. Price, and the public called it Yerkes from then on. Turn-of-the-century view, then operated by Edward O’Dell. The General Wayne post office was established February 5, 1830, closed on July 10; re-established February 8, 1850, then moved to another location as Academy Post Office in 1882. In 1854, Yerkes’ daughter sold the inn for $13,500 to David Young with an added acre, presumably across the road. James Baird owned it from 1883, and Timothy Murphy bought a part to build a blacksmith shop in 1885. Edward O’Dell bought the General Wayne in 1897 about the time Belmont Driving Park, just up Meeting House Lane, became a harness-racing mecca, with fans of fast horses taking sides, trotters vs. pacers. In 1936, a sheriff’s sales delivered the Wayne into the hands of I. Newton Smith who ultimately sold it to Barton Johnson, landlord for many years. An Historic District. 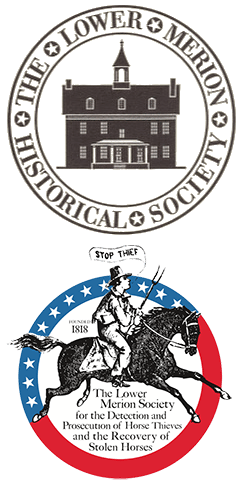 Concerned about the preservation of the building and the meetinghouse, a group petitioned The Pennsylvania Historical and Museum Commission in 1998 to include the two buildings in a small historic district. In September of that year, the Merion Friends Meeting/General Wayne Inn Historic District was created, thus honoring two important buildings and protecting the inn from inappropriate changes in the future. The General Wayne, c. 1912. Location, location, location…the real estate people tell us…is all important. The old Buck Inn of Haverford was blessed with a prime site, just where Old Lancaster Road and the New Lancaster Turnpike intersected and briefly overlapped. Currently, a car dealership occupies the place. Popular Meeting Place. The Buck enjoyed the custom of stage coach travelers and gentlemen on horseback, or local men serious about their farming, namely the Society for Promoting Agriculture; their meetings rotated among local taverns. Drovers of large herds and “long roaders,” those rough fellows who hauled loads in the 3,000 or more Conestoga wagons plying the route between Pittsburgh and Philadelphia, usually used the Red Lion, down the Pike. Some say the Buck was built in 1730 or 1735, but records were burned so no proof is available. Others have written that either John (the American) Penn or his brother Thomas had a hand in the establishment, but proof is hard to come by. What is absolutely certain, however, is that General Washington stopped at the Buck long enough to write a letter to Congress (September 15, 1777) begging supplies for his already threadbare troops, depleted by the lost Battle of Brandywine, and still months away from winter quarters at Valley Forge. Many innkeepers occupied the landmark: Griffith Evans, Samuel Rees, William Bell, Patrick Miller, John Gregory, Joe Miller, Jonathan Miller, and Edward Siter. Subsequent Changes. The property became a residence in 1844 after purchase by a member of the Martin family whose descendants continued to own it for more than 100 years. From about 1950 offices occupied the building until a national food chain proposed to buy it for $200,000 and build a modern place to offer their own style of refreshment. Neighbors flew to the defense of the historic former tavern, but Friends of the Inn failed in their efforts and the old Buck was demolished in 1964. Old postcard of Haverford’s Buck Inn. Neighbors, in 1964, protest the demolition of the historic tavern to make way for a fast food restaurant. (The building stood very close to today’s Greenfield Avenue on Lancaster Avenue, facing Ardmore West shopping plaza.) After the American Revolution, the new Lancaster Turnpike was built straight through Lower Merion, eight miles from center Philadelphia. The Green Tree. Malcome Guinn first began to dispense refreshment at the Sign of the Green Tree in what is now the middle of Ardmore, then Athensville. In 1808, Green Tree was sold to John Siter (Sider) who, we believe, changed the sign to depict a Red Lion. Historian William Buck, writing in 1859, claimed that the old building was torn down and the “present fine three story hotel…erected in 1855” and kept by Horatio (Rash) Litzenberg, who retained the name Red Lion. The Litzenberg Era. This “stand” was more than a tavern with rooms to rent upstairs and 30 acres out in back for herds of cattle en route to Philadelphia stock pens. Its east wing housed ageneral store where village necessities were stocked and drovers swapped yarns around the stove; in a corner there was a bar, open til 10 o’clock, closed on Sundays. Three times a week a wagon pulled by two horses made a trip to the wharves on the Delaware River to replenish merchandise. Later, back in Athensville, willing hands unloaded goods in exchange for “many a sarsaparilla, etc., particularly the etc.” wrote Josiah S. Pearce who himself may have rolled a barrel of mackerel or two for Mr. Litzenberg. A c. 1890s photograph records the patrons and the delivery carriages in front of the popular Red Lion Inn. Believed to have been built in 1796, it was demolished in 1941. One presumes that is proprietor John J. Dallas standing in front of his Red Lion Inn, c. 1915. Failing health forced Horatio Litzenberg into retirement; others ran the store, and eventually a son-in-law was landlord of the entire enterprise after Horatio died in 1880. The Pennsylvania Railroad advertised rates for summer guests at the Red Lion at $8 and $10 per week in 1884, when 700 people called Ardmore home. Years rolled by and Prohibition and progress spelled the end for the Red Lion as an inn. By early 1900s, the Autocar Company, Lower Merion’s only heavy industry, all but surrounded the old inn and finally occupied it as office space. The building was demolished in 1941. The building housed offices of the Autocar Company in the 1920s. The historic tavern looked sad at the end of its days in the mid 1930s. Toll houses were established along the township’s public roads in 1791. Lancaster Pike was a busy, narrow dirt road over which passengers, freight, the mail, and farmers’ produce were transported. The Philadelphia and Lancaster Turnpike Company was formed to care for the 62 miles between Philadelphia and Lancaster. By 1795, there were nine toll gates along the route. Many warehouses and shops were dotted along the way to deal with provisions and repairs. The Pike prospered as a tollroad until the canal and railroad took away its business and it became a broken-down, disreputable route. In 1876, the Pennsylvania Railroad, to prevent the extension of street car lines from the city into the suburbs, bought Lancaster Pike from 52nd Street to Paoli for $20,000. The Lancaster Avenue Improvement Company was established with A.J. Cassatt as president. A second company, the Philadelphia, Bala and Bryn Mawr Turnpike Company, was formed to control what is now Montgomery Avenue. No toll houses remain. it operated there until c. 1914. This toll gate was at Montgomery Avenue and Old Lancaster Road, across from Merion Meetinghouse. The toll house at Church Road in Ardmore was built in 1875. On an April evening in 1909, an auto crashed into the front. It was a popular misconception of struggling householders in the 18th and 19th centuries that tavern-keeping was a good way to make money. Quaker Joseph Price, hard-working and gregarious, a farmer, carpenter, coffin-maker, sawmill operator, major in the militia, was chronically short of cash, an affliction often mentioned in his 40-year diary. Four years after he finished several tasks for the new Lancaster Pike construction…he placed the milestones, for instance…he decided to build an inn at the six mile stone on the southwest edge of his own land. This building is still in use and is 200 years old in July 2000. Somewhat later view from the front. The inn, c. 1910, had become the residence of Parker Shortridge. The building survives today as an apartment dwelling. Transients, arriving late and leaving early, demanding meals at odd hours, put a strain on Mrs. Price. When an Englishman named Drake offered to lease the Old William Penn in 1802, Price readily agreed, and the inn became a boarding school for boys until 1807, then returned to being a tavern and hotel. The Shortridge Estate. In the 1880s Parker Shortridge, wealthy Philadelphian, bought 75 acres and lived in the house he called Penngrove, then added adjacent Clover Hill farm of 100 acres, A long driveway from Wynnewood station ran straight to Penngrove across fields, where later the Wanamaker store would operate. Price’s building still stands, an apartment dwelling today. The Syng Residence. In 1772, a master silversmith of renown… vestryman of Christ Church, treasurer of Philadelphia, trustee of the College of Philadelphia (University of Pennsylvania) and charter member of the Library Company…came out to the country to live and bought the tavern for his home. He was Philip Syng, Jr., son of a silversmith, father of eighteen children, and especially remembered for his inkstand used at the signing of the Declaration of Independence. He was also a watchmaker, a maker of electrostatic machines, inventor of the first lawnmower, and assistant to Benjamin Franklin in developing the lightning rod. Philip Syng died in 1789, age 85. If the next date is correct, we surmise Mr. Syng did not die on his plantation in Lower Merion, for it was sold in 1783 to Captain Robert McAfee, famous for his capture of the renegade Capt. Fitz. McAfee presumably again operated the house as a tavern. Landlords came and went until 1811 when James Anderson, M.D. purchased the property then serving the public under the sign of St. George, probably short for St. George and the Dragon, always a popular tavern title. The former tavern, winter 1911, after it had become the home of the Anderson family for 100 years. The Anderson Home. Dr. James Anderson had fifteen children, was strict, thrifty, litigious, and a classics scholar. The village around him he named Athens and was distressed when the populace added -ville to it. His son, Dr. Joseph Anderson never married, lived at St. George’s with a brother and sister. They passed the house on to nephew Dr. Joseph W. Anderson, also unmarried. The dynasty ended in 1957 with his death. The last Dr. Anderson is fondly remembered, and the family name is perpetuated by nearby Anderson Avenue that connects Montgomery and Lancaster Avenues. Some say it was originally a bypass for teamsters to avoid the toll booth below Athensville on the new Lancaster Pike. With the death of this respected doctor, the house, surrounded by great old trees, home to Andersons for 146 years, was doomed despite pleas of neighbors to save it. Apartments and the YMCA now occupy the land at the corner of Mill Creek Road and Montgomery Avenue.